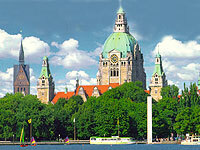 Hannover (500.000 people) main many small and large records, superlative or achievements of our city in the hiding. But without Hanover and many “Hannoveranern” there would be neither to PC's nor CD's and records, telephone or colour television. You did not know that? ... Here some facts come. ... the European color TV system PAL in Hannover from Walter Bruch was invented? ... the Evangelist church singing book is printed since 1747 in Hannover ? ... the word "Keks" was invented by Bahlsen in Hannover (instead of the English "Cakes") ? ... the telephone, the grammophon and the records by the Hannoveraner Emil Berliner were invented ? ... profile and tubeless tires with the Continental in Hannover were invented ? ... the term "fine food" was shaped by Heinz Appel in Hannnover ? 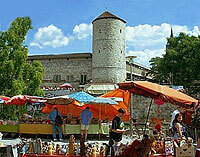 ... the first flea market in Germany 1970 in Hannover took place ? ... the first powered flight of the world of Karl Jatho 1903 in Hannover four months before the brothers WRIGHTS took place ? ... is the elevator in the dome of the new city hall the only one of the world, to which around the curve can drive and so that its inclination changes ? ... the water-soluble “tapetenkleister” in Hannover was invented ? ... Germany large magazine "Stern" and "Spiegel" in Hannover founded ? ... is the bookshop "Schmorl & von Seefeld" in Hannover the largest in Germany ? ... one of the largest drugstore chain "Rossmann" in Hannover was founded ? ... the first public gas station was opened 1923 at the "Raschplatz" in Hannover ? ... Gottfried William Leibniz (1646 - 1716) in Hannover the first calculating machine and the binary computing system (basis for PC systems) developed? ... the largest swing bridge of the world over the Suez channel in Hannover was built ? ... Haendels "fireworks music" and "water music" were inspired by "Herrenhausen Garden" and composed at the "Hannover Hof" ? ... the Autoscooter, the water chute and the roller coaster by Hugo Haase (1857?1933) in Hannover were invented? ... takes place in Hannover the largest "Schuetzenfest" celebration of the world each year since 1529 ? ... Hannover with a square kilometer the largest fairground and the largest hall (12 football fields largely) in the world has? The World Exposition “Expo 2000”in Hannover, was the first World Exposition in Germany ?